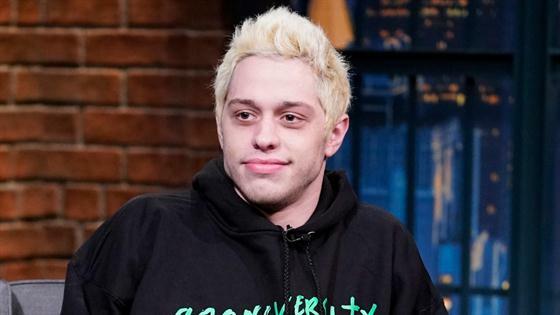 The 25-year-old SNL star, who has been open about his mental health struggles, had shocked fans on Saturday when he posted a seemingly suicidal post on Instagram after sparking some backlash by defending Kanye West amid the rapper's recent Twitter drama with Grande. Davidson then immediately deleted his account. "Man I'm so sorry I told a dumb joke," Grande tweeted. "I really didn't mean any harm. All I want everyone to be healthy and happy. So desperately. Please. My god...I'm downstairs and I'm not going anywhere if you need anyone or anything. I know u have everyone u need and that's not me, but I'm here too." Scores of fans and celebs expressed grave concern over Davidson online after his remarks. A spokesperson for the New York Police Department told E! News that they are looking into the social media post. TMZ reported that the NYPD received many of calls from fans worried about Davidson and sent officers out to find him to do a welfare check. The outlet later quoted multiple sources as saying that he rehearsing for Saturday's episode of SNL at NBC Studios in New York City. When asked by a fan why couldn't she have texted Davidson, Grande tweeted, then deleted the following post: "No I couldn't because I don't have his number. What else??????????????????? How else would we like to vilify me today? Pls keep going bc I haven't had enough guilt at all." Jon Cryer said he tried and failed to reach him by cell phone, then tweeted, "Am hearing Pete Davidson is at SNL and accounted for." "We are thinking of you, Pete. You are loved," he wrote. "And just a heads up, when you finally turn on your cell, it's gonna go apes--t for a little while)." "I'm in the plane now on the way to see Pete," Machine Gun Kelly, Davidson's co-star in the upcoming film Big Time Adolescence, tweeted. "Gonna make sure he's good, I promise. Can't have my boy in the darkness like that." Grande had written, "Guys, I know there are grown men arguing online rn but Miley and I dropping our beautiful, new songs tonight so if y'all could please jus behave for just like a few hours so the girls can shine that'd be so sick thank u." Grande had released her new single "Imagine" later that day as scheduled. "I know Ariana said this to be cool and didn't mean no harm but I don't like even slightest level of slight commentary from someone I know loves and respects me," West replied at 4:38 a.m. PT. "All of this foolishness weighed on my mental health so @ArianaGrande you know I got love for you but until you're ready to really make sure everyone's ok don't use me or this moment to promote a song." Grande then replied, "With all due respect, I don't need to use anyone to promote anything. Period. I was making a comment ab what men were doing at the time vs. women. It was a joke which I understand now was probably insensitive. I apologize if I was in any way triggering and hope u feel well today." Davidson then weighed in, writing in a rare Instagram post, "Bravo Kanye West for standing up for yourself and speaking out against mental health. I can't explain to you enough how difficult and scary it is to be honest about stuff like this. We need people like Kanye. No on should ever point fingers at you for your bravery in speaking about mental health. I'm seriously disgusted." In their comments, several of Grande's fans accused him of "attacking" her with his remarks. Davidson had said earlier this month he has been bullied for months, even before his and Grande's October split, which was not exactly smooth. Grande later issued a plea to her fans, saying, "I care deeply about Pete and his health. I'm asking you to please be gentler with others, even on the Internet...I will always have irrevocable love for him and if you've gotten any other impression from my recent work, you might have missed the point."